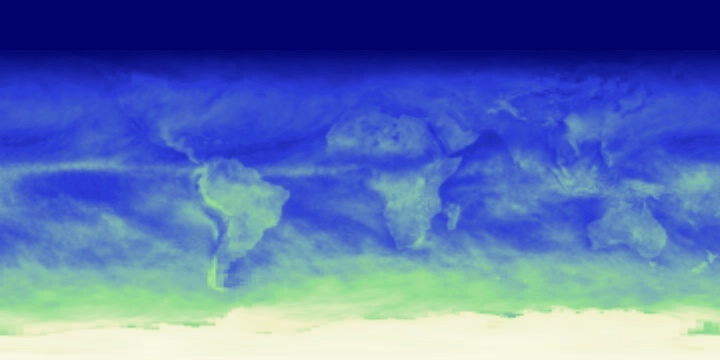 The NASA Earth Observations (NEO) site is a great place to find imagery of NASA Earth science datasets. 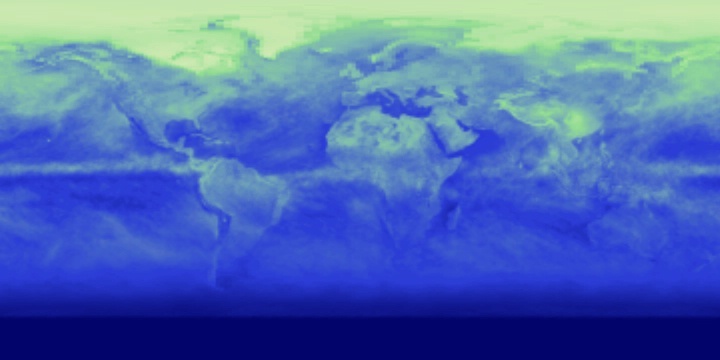 With NEO, you can download global and regional imagery in a variety of formats: PNG, JPG, GeoTIFF, and Google Earth. 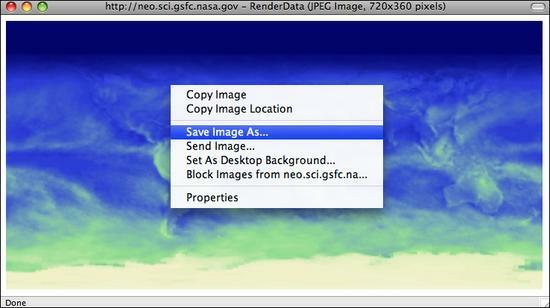 Additionally, NEO allows users to resize images and download them in color or grayscale. 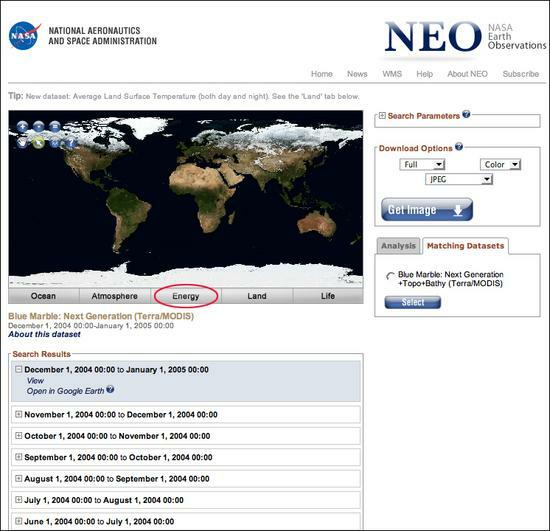 Users can also import NEO images directly into NASA's Image Composite Explorer (ICE) tool to perform basic analysis and explore relationships between datasets. 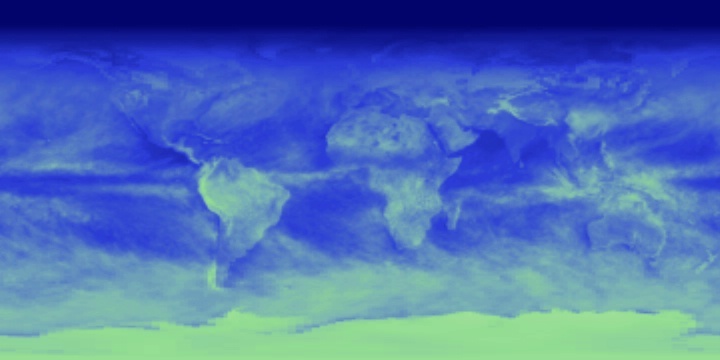 NEO includes over 20 distinct atmosphere, ocean, and land datasets, which are available as global snapshots in daily, weekly, and monthly time spans, and most are available at 0.1 degree (10-kilometer) resolution. The website has a Flash interface and therefore requires a Flash player to operate. Go to the NASA Earth Observations (NEO) website and display the Energy Dataset, Reflected Shortwave Radiation image for January 1, 2009 to January 31, 2009. 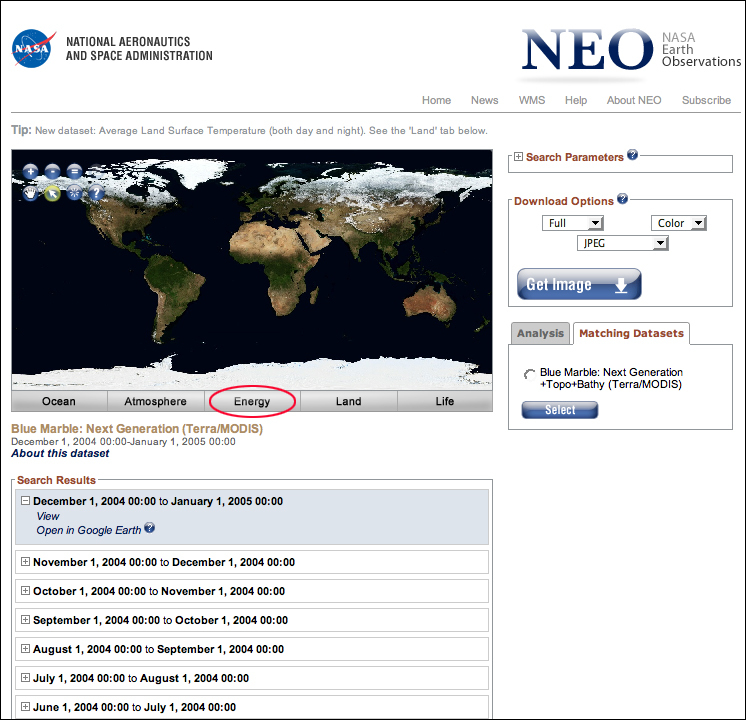 Go to the NASA Earth Observations (NEO) website. The NEO Web site opens in a new browser window. Be sure to use a Web browser that is both Flash and Java enabled. 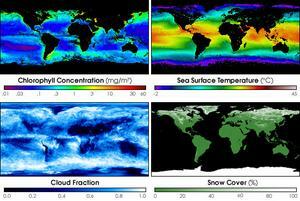 NEO organizes datasets into five categories: Ocean, Atmosphere, Energy, Land, and Life. 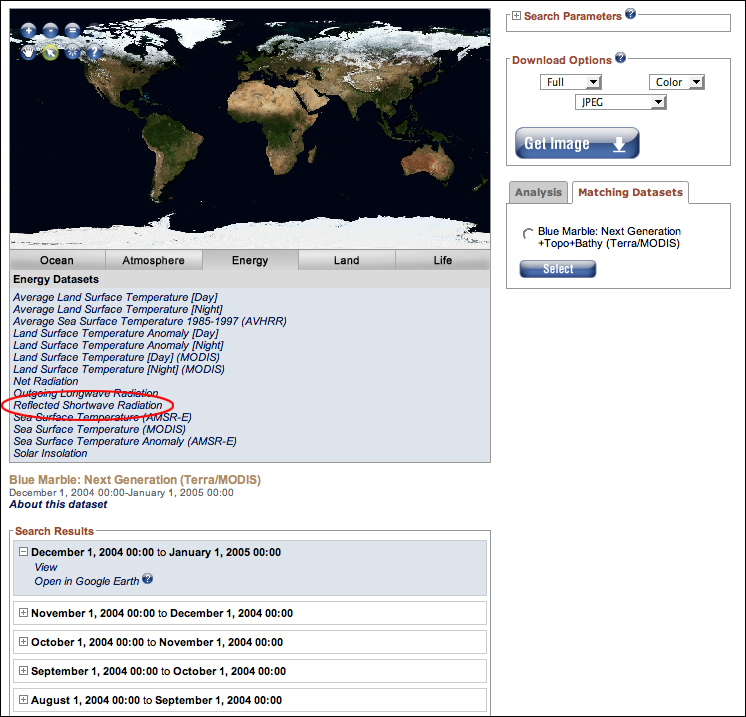 Click the Energy tab under the map to display the Energy Datasets. 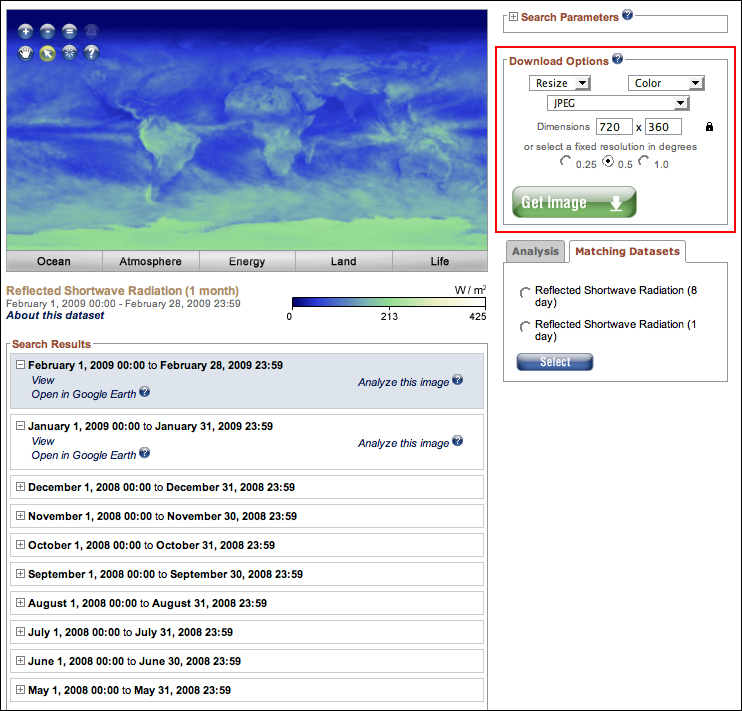 Locate the Reflected Shortwave Radiation dataset in the list and click it. The display window loads the most recent monthly map of Reflected Shortwave Radiation. To select a particular month of interest, refer to the Search Results field below the map. This field lists the most recent 10 months out of the twelve months for which this map is available. Click the Next link at the bottom of the list to get to January 2009. Click the "+" symbol to expand the field for a given date range. 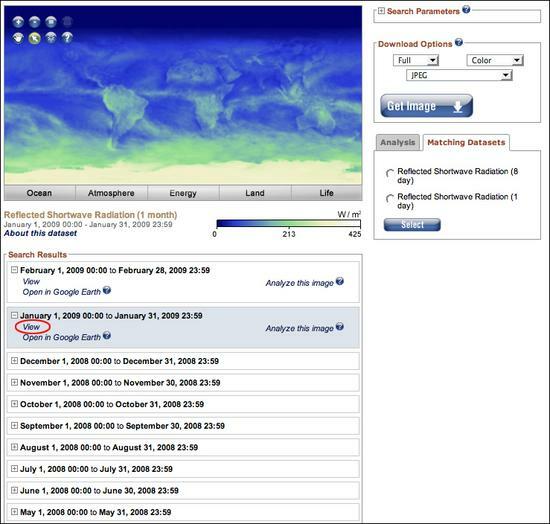 Click View to display the map for that date range within the NEO interface. Examine the January 1, 2009 to January 31, 2009 image of Reflected Shortwave Radiation. 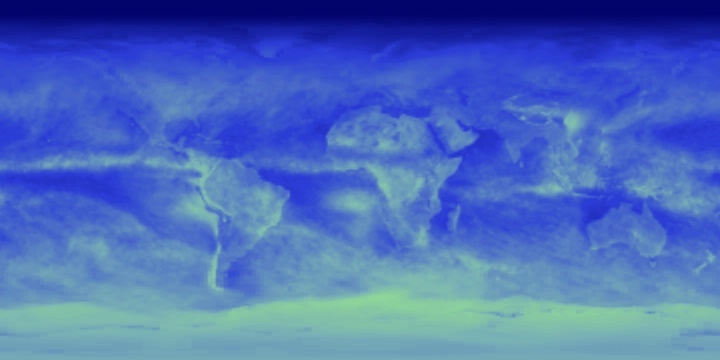 This image shows how much incoming shortwave radiation is reflected by Earth's surface. Reflected energy is measured in Watts/m2 (the amount of energy per square meter). Higher values indicate more reflected solar radiation. 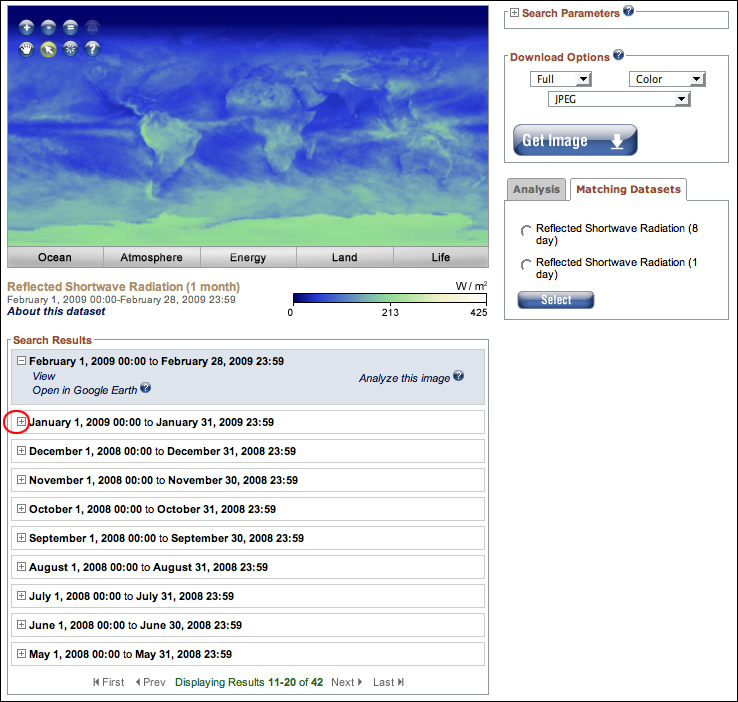 Lower numbers show areas of less reflected solar radiation. The amount of reflected solar radiation is affected both by the amount of incoming solar radiation, which can be zero during the Arctic winter, and the reflectivity of the surface. 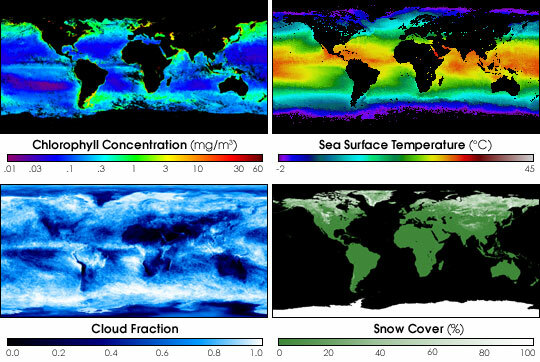 As you view these images, consider what factors are affecting the reflectance of the light and how the amount of reflectance varies both across the Earth's surface and through the seasons. Also consider how Earth's ability to reflect incoming sunlight impacts its energy balance and temperature. 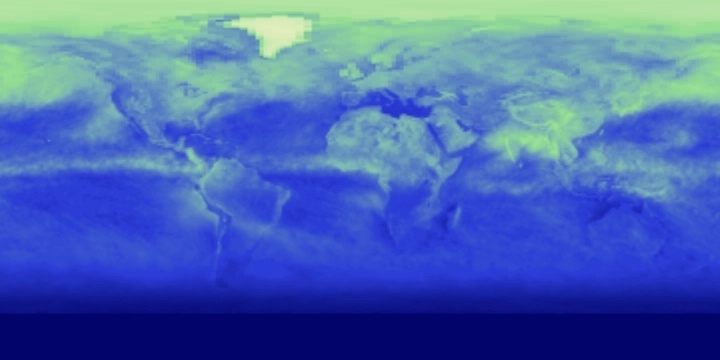 Click About this dataset to learn more details about what the map is showing. The About this dataset link is located in the lower left below the map. When you click the About this dataset link, the following text box opens. What areas are the brightest? What areas are the darkest? How would you define reflected shortwave radiation in terms of brightness? 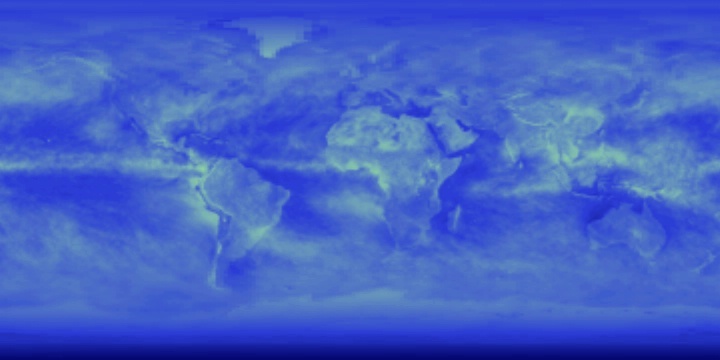 In the January 2009 Reflected Shortwave Radiation image, the areas that are the brightest are around the equator and Antarctica. 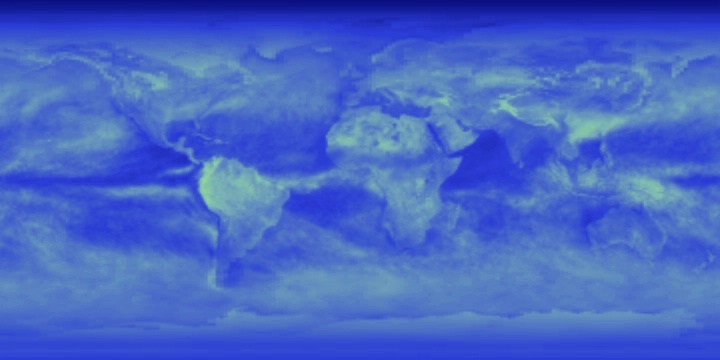 The darkest areas are located over the oceans and the Arctic. 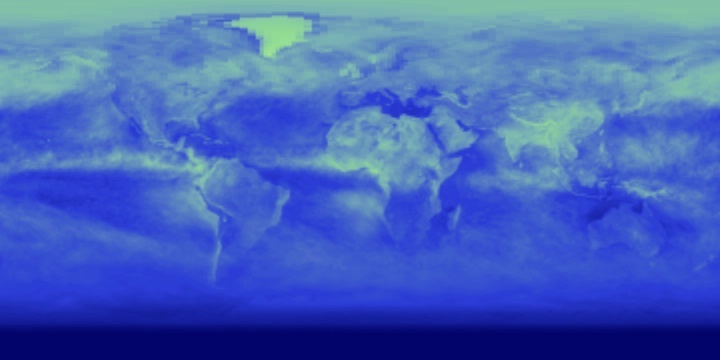 Because this image shows January, it is winter in the Northern Hemisphere, which receives much less direct sunlight than the Southern Hemisphere. So it makes sense that reflectance is low in the Arctic and it is dark in the winter. 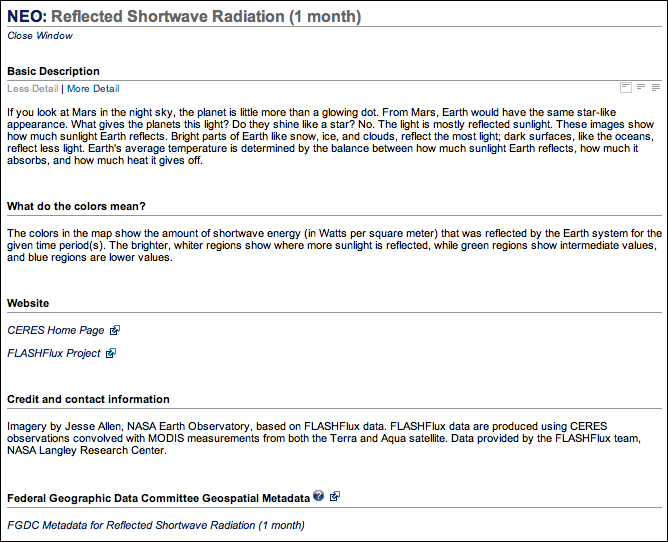 Reflected shortwave radiation is measured in Watts/m2 (the amount of energy per square meter). 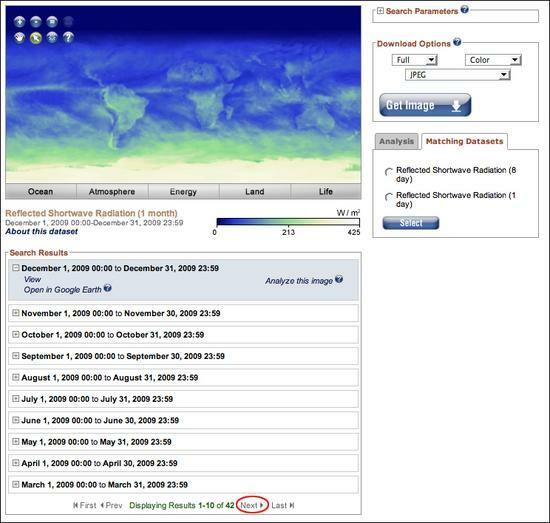 Higher values indicate more reflected solar radiation. 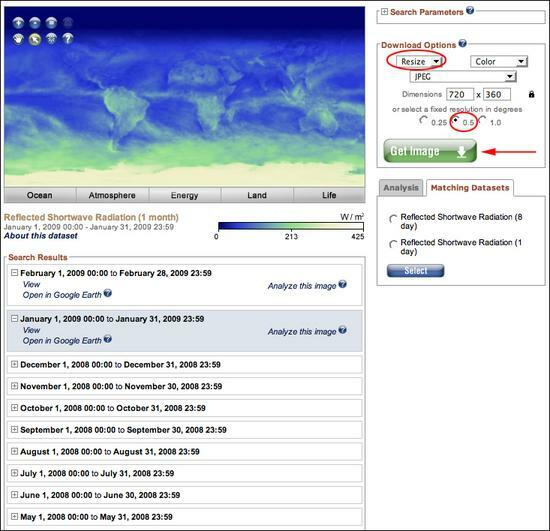 Lower numbers show areas of less reflected solar radiation. It is like the wattage of a light bulb  the higher the wattage, the brighter the bulb. Before you begin, create an Albedo folder to hold the twelve images you will download. 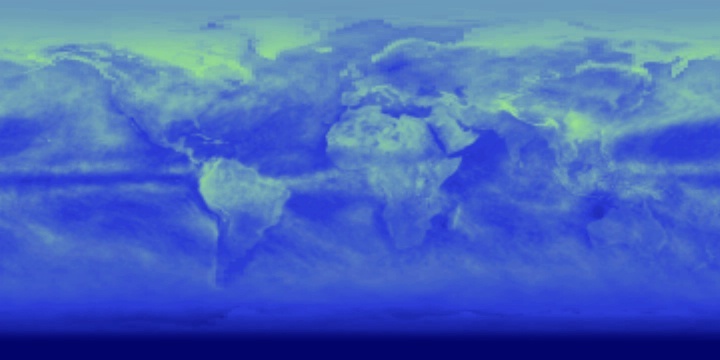 Download the January 1, 2009 to January 31, 2009 image at a resolution of 0.5 degrees and save it as 01_albedo.jpg. Repeat the process for all twelve months of 2009 until you end up with a total of twelve images, named from 01_albedo.jpg to 12_albedo.jpg. The January 1, 2009 to January 31, 2009 image is now displayed. In the Download Options box, change the selection from Full to Resize. 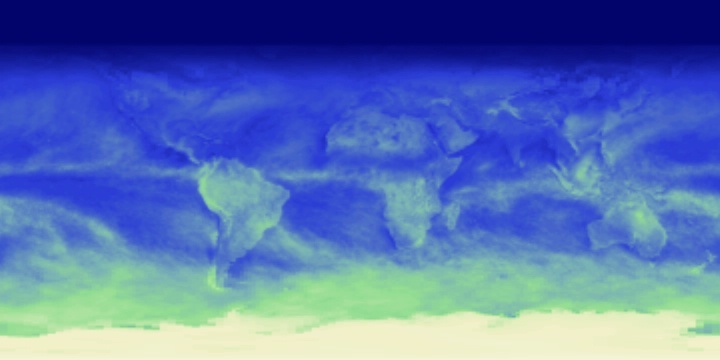 Then select a fixed resolution of 0.5 degrees. Click the Get Image button to render the image. The rendered image opens in a new window. On a PC, right-click on the image and on a Mac, control-click on the image to download and save it. Do not change the file format, keeping the image as a jpeg. Save the image into the Albedo folder you created and name it 01_albedo.jpg. 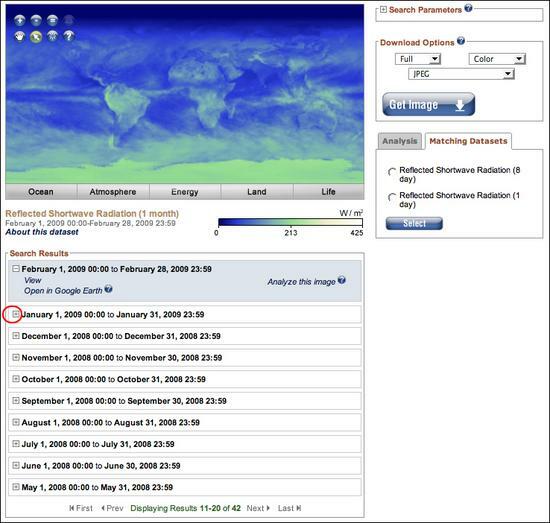 Click View to display the February 1, 2009 to February 28, 2009 image. Use the same procedure as above to resize and render an image with a fixed resolution of 0.5 degrees. Save the image, naming it 02_albedo.jpg. 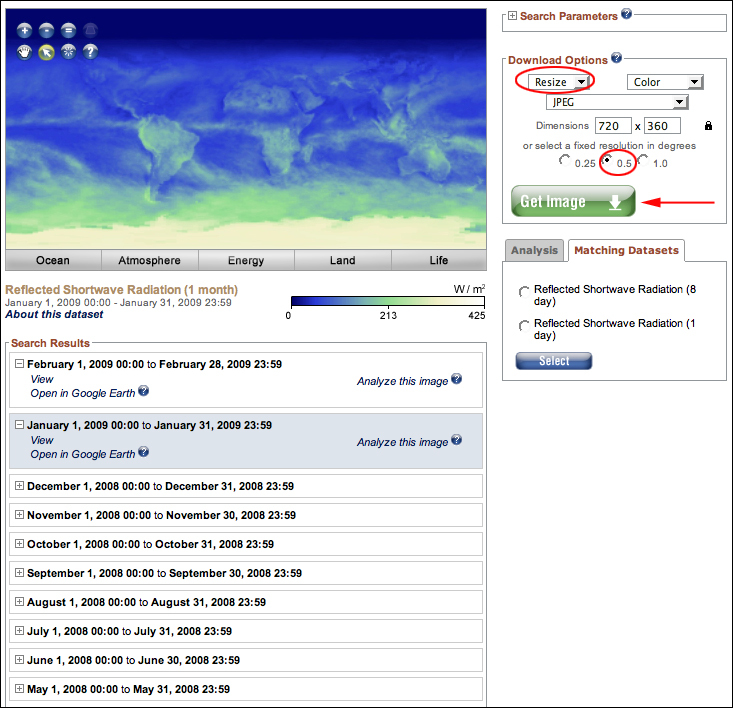 Use the Prev button at the bottom of the Search Results to access the remaining months from 2009. You should end up with a total of twelve images, named from 01_albedo.jpg to 12_albedo.jpg. If you had difficulty obtaining the images, then download and save the ones here. Click each thumbnail to open the full size image in a larger window. Then right-click or control-click to choose file Save Image As... Do not rename the files. Keep them as 01_albedo.jpg, 02_albedo.jpg, etc. Create a folder (directory) on your computer for your Day 2 files. Use the process described above to gather your own set of time-series images from one of the other datasets within NEO and save these to the Day 2 folder. In Part 2, you will be stacking and animating these images, so be sure to gather at least 12 images. Then go to the Part 1: Share and Discuss page and post just one of your images to demonstrate that you can download an image from NEO. 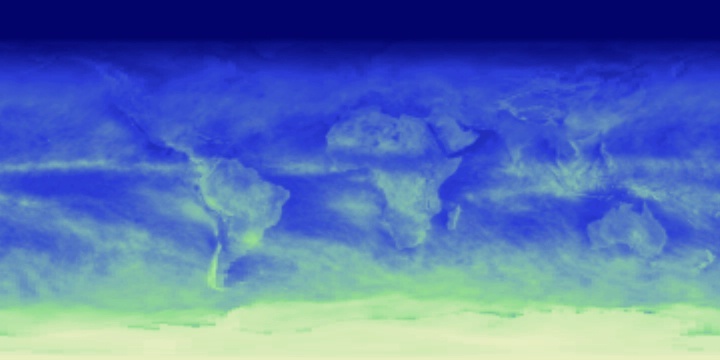 1Adapted from Earth Exploration Toolbook chapter instructions, "Using NASA NEO and ImageJ to Explore the Role of Snow Cover in Shaping Climate" under Creative Commons license Attribution-NonCommercial-ShareAlike 1.0. 2Adapted from Eyes in the Sky II online course materials, Copyright 2010, TERC. All rights reserved. 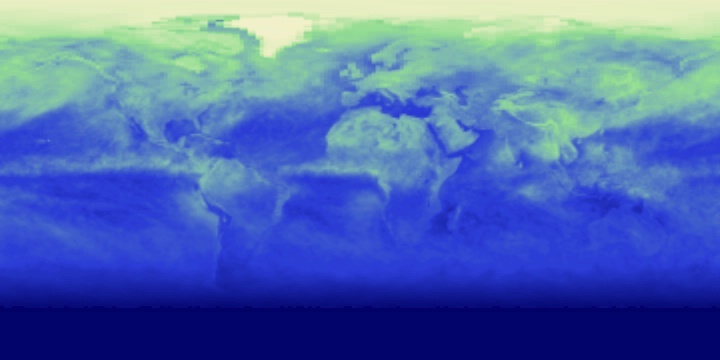 3New material developed for Earth Analysis Techniques, Copyright 2011, TERC. All rights reserved.